Love gin? Love hot cocktails? 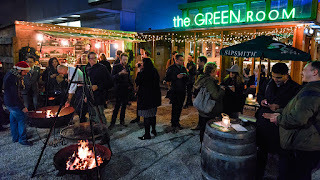 You're in luck this winter, as The Green Room, The National Theatre's restaurant at 101 Upper Ground, has opened the Frost Fair Bar, a pop-up garden bar with Sipsmith. It's open daily from 5pm - 8.30pm (weather permitting), and it's perfect for a post work or pre-theatre hour of two. "Celebrate London's gin history this winter and enjoy a delicious menu of specially curated hot gins from Sipsmith at the Green Room's festive pop-up garden bar. The warming menu includes a Hot Negroni, a classic Hot G+T, Mulled Sloe Gin, the Mulled London Cup, Mulled VJOP and the Gin Hot Toddy."